This bark takes no time at all to make and is easy to throw together. 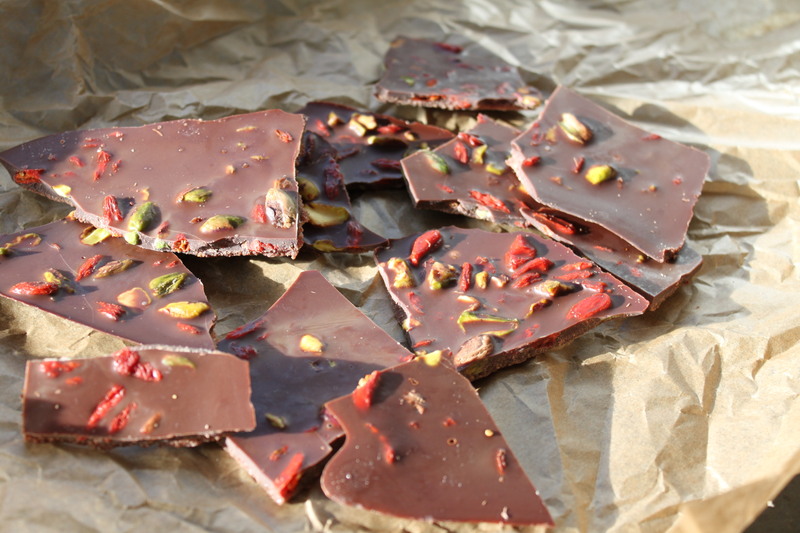 If you don’t have goji berries or pistachios on hand then substitute whatever you have available. Cacao powder is different from cocoa powder as it hasn’t been roasted, toasted or cooked and therefore retains all its health benefits. Cacao is known as one of the most powerful antioxidant foods available. It also has a high magnesium content which helps with the function of our digestive systems, brain, heart and bones. 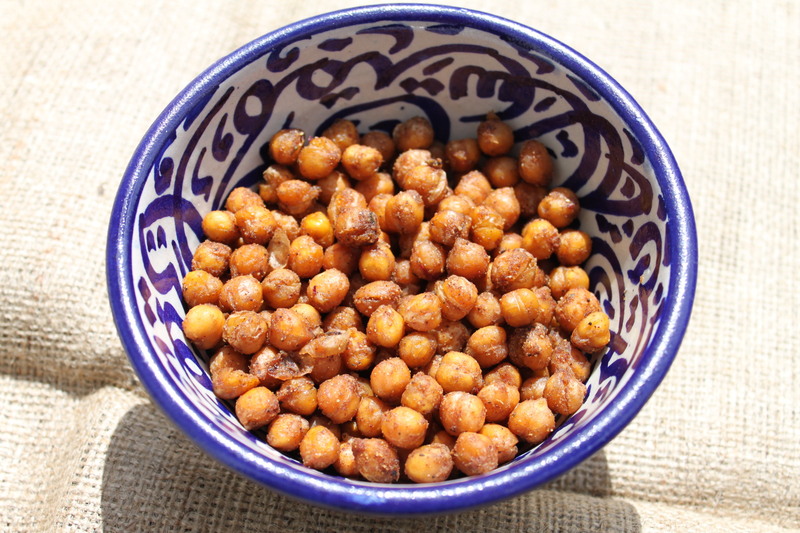 I love chickpeas and any dish that contains them or is made with them. I’ve always got some in the house, tinned or dried. I cannot believe I haven’t tried roasting chickpeas before now, they are utterly delicious and very, very moreish (be warned!). I was developing recipes the other weekend and instead of making hummus I thought I’d try these and now making them weekly, I’ve even got my friend hooked on them. So now I’m wracking my brains thinking of other recipes I could incorporate chickpeas in – baked goods? Who knows? But I’m sure I’ll have fun trying. 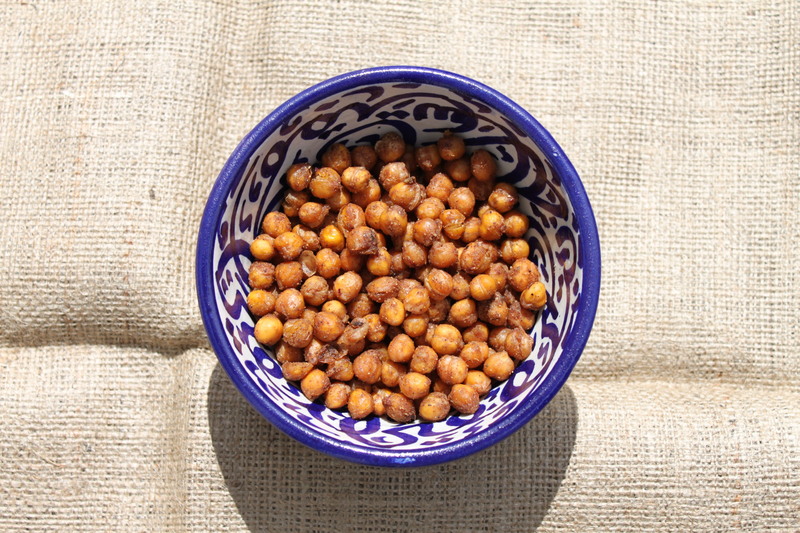 I use Ras El Hanout on these chickpeas but you could use any spice you like. Ras El Hanout is a Moroccan seasoning with cinnamon, lavender, rose petals and cloves among some of the spices and herbs used to make it, which makes it lovely and fragrant. These are lovely enjoyed warm but be sure to allow them to cool enough when you take them out of the oven. 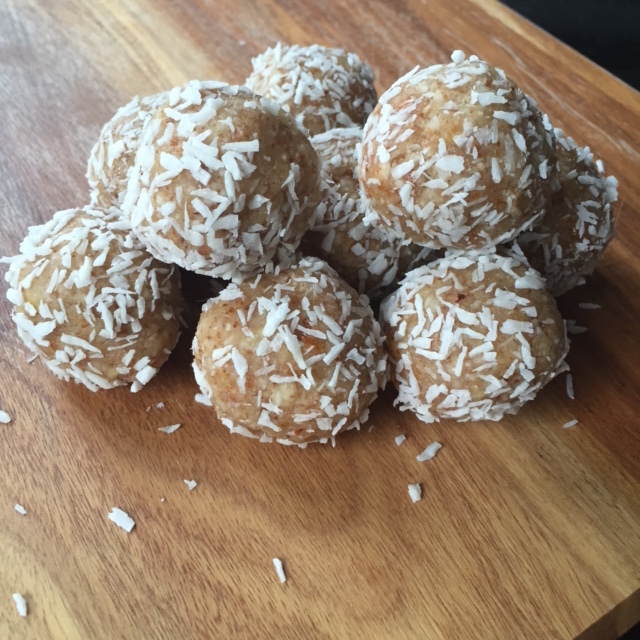 I didn’t the first time making them and ended up with a sore tongue! Pre-heat oven to 180C and line a baking sheet with tin foil. After you have rinsed the chickpeas pat them dry with kitchen towel and put in a bowl. Pour over the oil and seasoning, mixing well so all chickpeas are covered. Pour onto the lined baking sheet spreading out the chickpeas. Put in the oven for 25-30 minutes, giving a stir halfway through cooking time. Remove when golden and crispy. Allow to cool slightly before enjoying. My go to snack is normally a handful of nuts. Any type of nut will do. In fact if you look in my fridge I have a shelf dedicated to nuts, I’ve containers of raw almonds, cashews, pecans, walnuts, macadamia and seeds too! If you look inside any of my handbags you’ll probably discover some nuts in a wee ziploc bag. 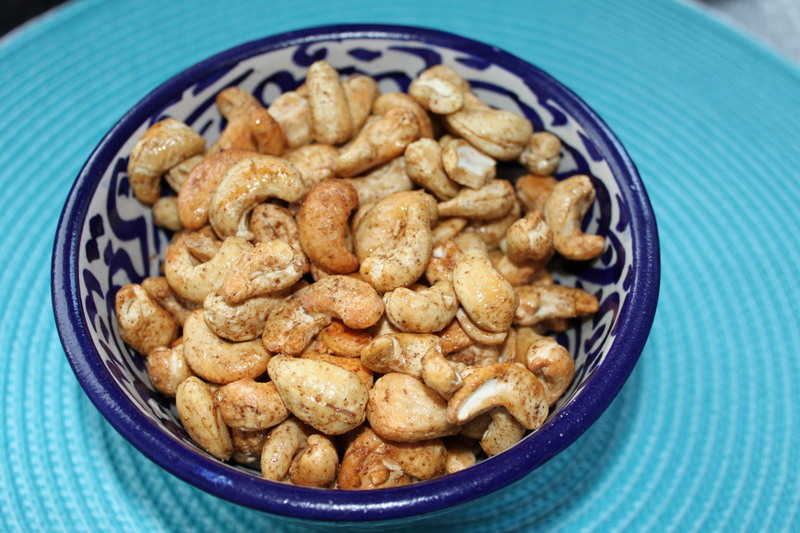 Sometimes though I need to add some flavours to the nuts to liven them up a wee bit. When I first moved to the Middle East many years ago, everyone kept saying to me that I must try falafel. 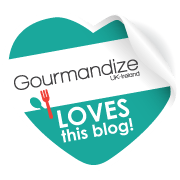 I wondered what on earth they were actually wanting me to try – visions of curried camel or roast camel swirled around my mind. Well thank goodness it was neither of those things; falafel is actually a ball or patty of chickpeas with seasonings and are deep-fried. And they are good. They are, so, so good!